The topologist's sine curve is a classic example of a space that is connected but not path connected: you can see the finish line, but you can't get there from here. There are four basic properties of sets that beginning analysis and topology students see: open, closed, compact, and connected. Of those properties, it seems like connectedness should be the easiest. Connected has a pretty clear meaning in English. But it's surprisingly difficult to get the mathematical definition just right. The topologist's sine curve is one of the examples that helps illuminate exactly what it means to be connected. As a regular English word, we usually think of connectedness as a property of two things: A and B are connected if they overlap in some way or if you can get from A to B. In mathematics, connectedness is a property of one set. How do we make the English idea mathematical and apply it to one object? One tempting definition is that a set is connected if you can get from one point in the set to any other point in the set. But what about duplexes? You can walk between rooms in the same unit of a duplex, but you can’t get from one unit to the other one without leaving the duplex. Is a duplex connected? I think it is. So that's not quite the right definition of connected. Being able to get between any two points in a set is a very useful mathematical property, but it’s too strong. Mathematicians call a space with that property path-connected, and we’ll talk more about that later. Connectedness is a little more subtle. For our second attempt, we’ll start here: a set X is connected if you can't stick part of it in a set A and the rest of it in a set B so that A and B don’t overlap. There’s one tiny problem: that definition is totally useless. It would make too many spaces disconnected. We could break up the set of all real numbers into numbers that are greater than or equal to 0 and numbers that are less than 0. Those don’t overlap, so by our definition, the real number line would be disconnected. Clearly, it should be connected, and any definition that makes it disconnected is wrong. What was the problem? We included the boundary point 0 in one set but not the other. If we had included it in both, the sets would overlap, and if we included it in neither, the sets wouldn’t overlap, but they wouldn’t cover the whole real line either. The "right" answer is to exclude the endpoints from both intervals. Intervals that don’t include their endpoints are called open, so we say that a set X is connected if you can't stick part of it in an open set A and the rest of it in an open set B so that A and B don’t overlap. This definition doesn’t just work for one-dimensional sets; we can define openness in higher dimensions as well. Basically, a set is open if none of its points are right on the boundary, or equivalently if every point in the set has a little blob around it that’s also in the set. All that work just to define connectedness! Now for the payoff. 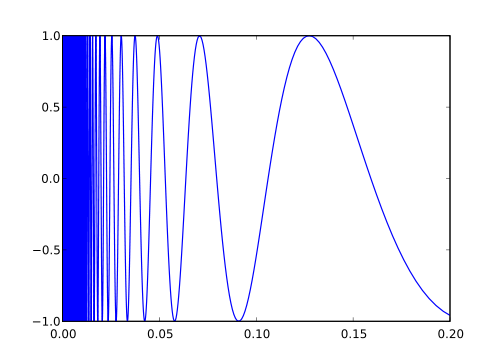 Behold, the topologist’s sine curve! A portion of the topologist's sine curve. Note that the left part of the graph isn't actually solid; that effect is merely a relic of the finite nature of our existence. Image: Morn the Gorn, via Wikimedia Commons. This space is the graph of the function f(x)=sin(1/x) for x in the interval (0,1] joined with the point (0,0). We can see that as x gets closer to 0, 1/x gets larger and larger, so sin(1/x) oscillates wildly between -1 and 1. The topologist’s sine curve is one of the first examples a math student will see of a set that is connected but not path connected. You can see the finish line, but you can't get there from here. Why is it connected? Let’s try to put it into two nonoverlapping open sets. One of those sets has to contain the point (0,0); since it’s open, it also has to contain a blob around (0,0). No matter how small that blob is, it’s going to include some points with positive x-coordinate and 0 as the y-coordinate, which means it will include some pieces of the graph of f(x). That means that if we want to disconnect the space, we’ll have to put part of the graph of f(x) in one set and part in the other. But there’s no way to split up the graph. It’s a continuous curve, so like the real line, it’s connected. Why isn’t the topologist's sine curve path-connected? Let's say you're trying to get from a point on the graph of f(x) to the point (0,0). You have to walk along the graph towards (0,0), but you'll be stuck walking forever. You’ll get really, really close, but you’ll always have an infinitely long road still ahead of you. A very closely related space is the closed topologist’s sine curve. A closed space contains all of its boundary points, meaning points that are arbitrarily close to points in the set. With the way the curve f(x) oscillates, all the points on the y-axis between -1 and 1 are very close to points on the curve, so to close up the topologist’s sine curve, we throw in that line segment as well. This doesn't ruin the other topological properties—it's still connected but not path connected—but now it's closed as well. Some people like that kind of thing. If you’ve taken a topology class before, you might have seen the definition of the topological property called compactness: a set is compact if every open cover of the set has a finite subcover. The topologist’s sine curve is not compact, but the closed topologist’s sine curve is. In the spirit of frustrating math textbooks everywhere, I’ll leave an exercise for the reader: find an open cover of the topologist’s sine curve that does not have a finite subcover and figure out why the example doesn't work for the closed topologist's sine curve. Write your answer on the back of a closed, uncountable, nowhere dense subset of the [0,1] interval and send it to Cantor Plaza, Box Log2(3).